Framing a painting print is a great way to compliment your art and protect it. Framed Vincent Van Gogh paintings can be easily cleaned from finger prints by simply wiping the glass. For bright rooms, we offer different glass types for framed art to reduce the glare from light and reflections. FramedArt.com's expert framers understand the protective needs and stylistic effect that a frame can have on a painting. 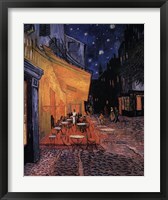 That is why we not only hand craft every framed The Cafe Terrace on the Place du Forum, Arles, at Night, c.1888 print once it is ordered but also inspect it. We guarantee your framed painting satisfaction.